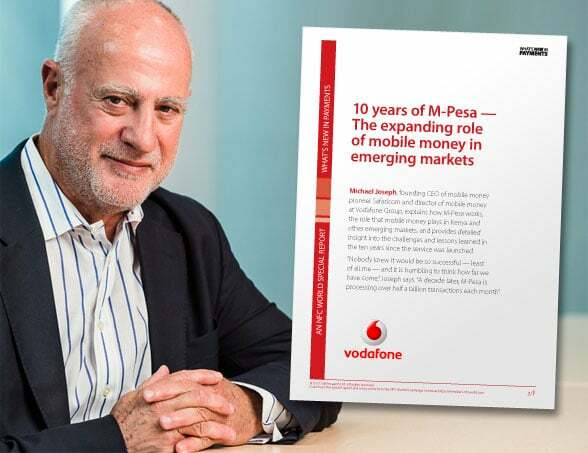 M-Pesa pioneer Michael Joseph, founding CEO of Safaricom and now director of mobile money at Vodafone Group, explains how the service works and the lessons learned from building and deploying one of the world’s most successful mobile money services in an in-depth Q&A that is now available to download free of charge from the NFC World Knowledge Centre. “There are three key lessons we have learned,” Joseph says. “First, a supportive regulatory framework for enabling payments is essential in any market where you plan to launch services. “Second, the service itself needs to be reliable, simple and accessible, delivered through a well-trained, widespread agent distribution network. “Finally — and perhaps most importantly of all — for your service to be adopted, your customers need to trust your brand with their money. “Mobile money is still a nascent market, and we are learning all the time,” he adds. “Since launch we have learned that other countries beyond Kenya have different ‘pain points’ and ‘hook’ use cases to drive people towards using and trusting the service. Readers can download the full eight-page Q&A from the NFC World Knowledge Centre.